While you can eat a fully cooked ham cold, heating it gives it a richer taste. You can even add seasonings or rubs to amplify the flavor. Because it heats up slowly and can lock in the moisture when heated properly, your crock pot is a perfect cooking vessel to heat your fully cooked ham. The key is keeping the ham enclosed and the temperature low. When you remove your fully cooked ham from the crock pot after cooking time, it should taste flavorful and have a moist texture. Remove the ham from its packaging. Wrap the ham in a large piece of aluminum foil to completely enclose it. This keeps the ham moist by sealing in the juices. Pour a 1/2 cup of water into the crock pot. Set the ham in the crock pot. Cover the crock pot with the lid. Switch the crock pot temperature setting to "high." Heat the ham for one hour on high. Turn the temperature down to "low." Heat the ham for about three hours on "low." Remove the lid from the crock pot. 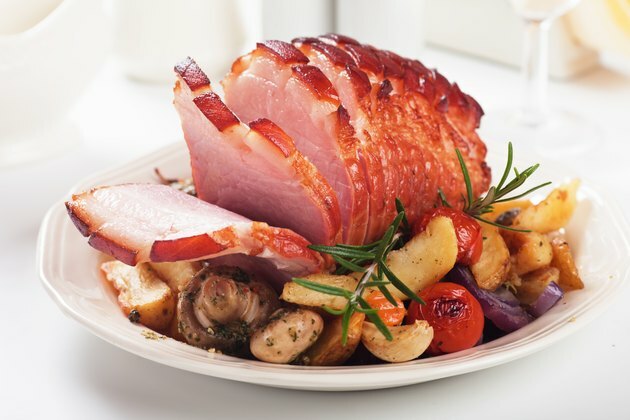 Remove a piece of the aluminum foil from the ham to expose one of its thickest parts. Insert a meat thermometer into one of the thickest parts of the ham. It should register 140 degrees Fahrenheit when the ham is heated through. Continue heating the ham in the crock pot until it reaches the correct temperature. If you wish, make a rub of mustard, honey or brown sugar, and Worcestershire sauce to rub all over the ham before you wrap it in the aluminum foil. Or use any of your other favorite rub recipes. Add liquid smoke to the ham before enclosing it in the aluminum foil to give it a smokey taste. Most hams contain a high amount of sodium and fat, so you should monitor your portions.